I came home today with printed photos from our trip to Naples, Florida to visit my parents. It's so rare to even print pictures these days with digital photography being what it is...so needless to say, Maggie hasn't been looking at too many photos - although MANY of her have been taken. 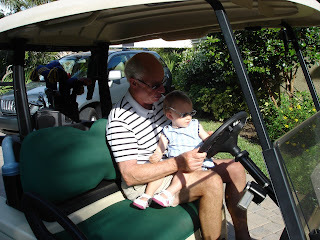 The photo with my Dad in the golf cart with Maggie came up and Maggie started to study the picture. Joel & I paused and just watched her & sincerely I swear you could see her wheels just churning. She pointed to my Dad & said 'Papa', and then 'vrrrrrrrrrrrrom', 'beeep beep.' Joel & I about feel over with such pride & excitement because it was the first time she displayed memory. Oh, the power & pull of routine. We were going through our usual Monday morning; watching Sesame Street while I slowly (oh ever sooo slooowly) make my way out of bed; Maggie brushing her teeth & singing to Mono while I shower; biting into each orange before it's juiced while I sip on my coffee; ...you know, the usual. So on our way over to Cecilia's house this morning (to spend the day with Lucy, her nanny), we were detoured due to road construction. We ALWAYS take the same route to get there, which involves a HUGE classic San Francisco hill, where we put our arms in the air while we go down (like a roller coaster ride) and wave goodmorning to the downtown San Francisco skyline. 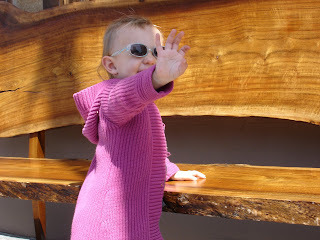 Maggie usually gets her hands up & yells 'weeeeeeeeee.' Well...little did I realize until this morning how much Maggie looks forward to this little routine. We were detoured the block before the hills began & literally, it was like the sky was falling. So I purposely detoured again & found another hill similar to our routine & it was all smiles after that...but WOW. How cool is that. My little navigator letting me know we were off course!